This year’s Royal College of Midwives (RCM) conference is being held in Manchester today and tomorrow (4 and 5 October) with more than 3,500 delegates attending. This year’s conference theme ‘Safety, Partnership and Leadership’ fits so well with what we are doing in PHE Screening in terms of developing national standards and guidelines, stakeholder engagement and quality assurance processes to further improve patient safety. Representatives from the national antenatal and newborn programmes and Screening Quality Assurance Service (SQAS) are there on stand number 34 to update you on all our national screening programmes and answer any questions you may have. We particularly want you to know about our new newborn screening blood spot cards and e-learning packages to be released this autumn. At the PHE Screening stand we have packs that include up-to-date flyers on the work of all 6 programmes, the screening timeline and updates on the UK National Screening Committee (UK NSC), SQAS, the young person and adult screening programmes and education and training resources. As it proves so popular every year we are again running a raffle to win a place on our popular and highly-rated PHE Screening Masterclass. 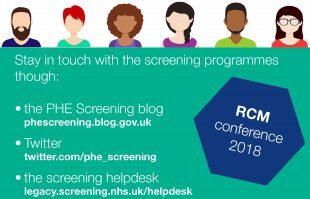 Come and say hello and sign up to our PHE Screening blog to make sure you stay up to date with developments in all the national programmes. For those of you who can’t make it to the conference, or those of you who simply want more information, all our resources are available on GOV.UK and the screening CPD site. Did you miss any of our screening blogs in September 2018?